WAYNE HARRISON'S CHEEP in association with Auspicious Arts projects and The Seymour Centre presents STAINLESS STEEL RAT by Ron Elisha in the York Theatre at The Seymour Centre. What a distinctly exciting frisson to go to the theatre to see a new Australian play about contemporary world events. To see a work that did not have its Australianess filtered through the adaptation of a "classic" play from world literature. Even more of a relief that it wasn't our Russian friends that we were pillaging, once again. That STAINLESS STEEL RAT is not a complete success did not have too much of a dampener to my response to the night. I enjoyed myself. A play that sets out to examine, and explain, who The Most Dangerous Man (perhaps, Julian Assange) might be, is interesting, and was, mostly, interesting. I didn't know much about him other than the press attributions that the world powers and their politicians have squealed at us. I can't say that I know, for certain, anymore about him, having seen this play, but it was a mostly funny and ultimately intriguing couple of hours. I reckon with more editing and focusing there is a damn good evening fare there. Is this Most Dangerous Man "a bogan with a modem" or "the most controversial revolutionary Australian of our time"? A fighter with a conscience with contemporary media at his finger tips: WIKI LEAKS. A new kind of world 'saviour' with a passion to bring the old world diplomatic games out into the light and onto a new open playing field? The personality and behavioural traits revealed in this play suggests a co-incidence of familiarity that The Aaron Sorkin script for THE SOCIAL NETWORK reveals of Mark Zuckerberg - a kind of collection of Asperger like fixations. When the performance began it had the fresh air feel of a wickedly amused David Hare, running with an acerbic eye and heartbeat for current events (STUFF HAPPENS, 2004; THE POWER OF YES,2009) and the conspiracy humours of a Stephen Sewell (MYTH, PROPAGANDA and DISASTER in NAZI GERMANY and CONTEMPORARY AMERICA, 2004). Unfortunately, this did not last long. 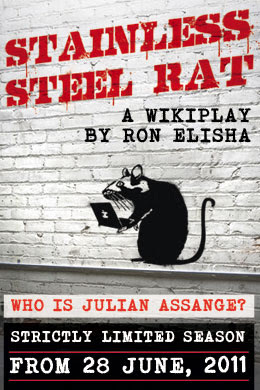 The best part of the play is the playful game playing by Ron Elisha with the satiric targets at the centre of the real Assange world. The comic techniques employed, however, cross a wide range of modes, from complicated and amusing set speeches that may or may not be tongue in cheek , to quips of excellent one-liners, to broad "Wharf Revue turns - a contemporary Australian P.M. impersonation by Valerie Bader backed by a cruel presence of Her Consort swathed in dressing gown and head towel, clipping his toe nails for instance. More tidiness in this area of the writing and the slipstream of the accumulative wit might make a very ,very good night. What is even more essential, however, is the need for the dramaturgical pencil to remove the absolutely unnecessary framing device and sub plot that concerns a film maker, husband and wife team having marital problems in a boring soap oper-ish manner. It was exhaustingly superfluous and sexually gratuitous. If it were a novel, I would skip forward to the Assange satire as quickly as possible. In the theatre experience it was a holding of breath to maintain patience and wait for the return to the main game. Cut the "crap" and concentrate on the comedy and the exposé - the sexual parallels seemed to be a stretch that mostly cheapened the effect of the revelations and observations of the rest of the play. 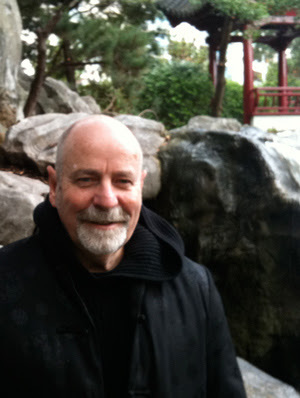 Wayne Harrison has assembled a team of 11 actors to play some 28 characters. Glenn Hazeldine, David Downer, Russell Smith bring zip and comic vocal energy and flair to bear in their many tasks. Caroline Craig playing the wife/film director, in the dud part of the writing, is magnificently valiant with her focused and stylish skills that contrasts to the raffish charm of Peter Phelps as the husband/film producer who, technically, does not have the imaginative vocal energy to keep the "soap opera" alive. Ms Craig is forced to work hard. Darrren Weller playing The Most Dangerous Man scores points for dyed white hair and an approximate look-alike appearance but essentially does not have the imaginative vocal chutzpah to keep the "ball"of comedy in the air. He is relatively ponderous in sound and creates a dullish impression. He has a go at the climatic act two speech of passionate character justification/declaration, but a lack of relaxation reveals an effortful skill that undermines the impact. Valerie Bader with the brilliant but blandly superficial knack for the skills of revue sketch material is strikingly funny, especially in the Australian P.M. sequences. But it is here that I felt that Mr Harrison gave in to the temptation of easy laughs and lost control of the comic integrity of the play. The production lacked style consistency, no matter the number of laughs scored. The committed deployment of the necessities required by Cooper Amai, Marshall Napier, Katrina Retallick and Cameron Craig were highly appreciated by the audience on the night I attended. Brian Thompson has designed raised platforms with a large movable screen, that allows the traffic of furniture on and off the main stage action, with the necessity of swift costume changes designed by Rita Carmody. The design is pragmatic and provides a simple solution to the necessities of the writing as it stands now, with many short scene and location changes. The Lighting is by Martin Kinnane. Ron Elisha is a Melbourne based writer and was last seen on stage in Sydney with a production of THE SCHELLING POINT at the Old Fitzroy. IN DUTY BOUND, TWO, PAX AMERICANA and the Australian Writer's Guild Award in 1982 for EINSTEIN are other plays of his. "WAYNE HARRISON'S CHEEP is a recent initiative keen on new Australian writing for the theatre. Its next project, if the money doesn't run out, is Justin Fleming's ORIGIN". Spend some cash and time with the STAINLESS STEEL RAT, and you will have a textually flawed experience but one of promise and fun. Support this project and the nurturing of the Australian writer.